For many this will be the affordable workhorse Panther, true to the original concept and a no-brainer, reliable purchase. Cheap but not shabby. Crunchy timbre, thick tone. The cheapest Panther, the Blade is no more shabby for that. The 14"x5 1/2", 1mm steel shell has a just-visible internal vertical join and turned-over traditional 45 degree bearing edges. The shell and all the hardware are finished in a brushed metallic grey, giving the drum a more expensive image. It was also exactly round by our measurements. 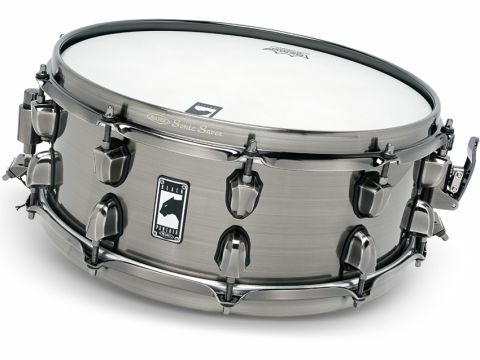 Steel may be the low-cost option but it is a splendid material for snare drum shells. At medium tension you get a dry, dark, thick and parchment-like tone in the centre, but when you catch the rim it rings out like a - well, like a steel drum. The timbre is not as varied or complex as maple, say, but crunchier, so your double strokes are distinct and keen. The shell matches perfectly with the new Sonic Saver hoops and rim shots and cross-sticks are a joy, cutting through with ease. That distinctive steel ping is what you need to power just about any band.